Are you looking for a dessert with minimum effort and maximum effect? This no-bake cheesecake in a glass is super easy to make and best of all, there is no need to turn on the oven. For the base, I used digestive biscuits but you can use hobnob, graham crackers or any sort of crumbly biscuits. To make the cheesecake filling I combined fat-free cream cheese, vanilla non-fat Greek yogurt, and whipped cream. If you replace the vanilla yogurt with natural yogurt add 1 tablespoon of sugar or honey. Even though I used 0% fat Greek yogurt and fat-free cream cheese, I wouldn’t say it is a healthy dessert as whipping cream is really fattening. However, since one single portion is quite small (if you use small glasses ), I would think it’s still a nice sweet treat to have once in a while. Right?!?! Instead of berries, you can also top the no-bake cheesecake with lemon curd, berry sauce or jam. Be creative! It’s the perfect dessert when you are entertaining as you can make it ahead of time and stick it in the fridge until you are ready to serve it. 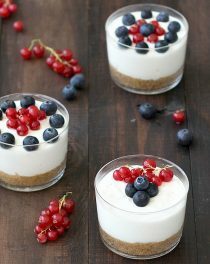 This no-bake cheesecake in a glass is so quick and easy and it’s one of those desserts that would never fail to impress your guests! Put the biscuits in a food processor and pulse until they are finely ground. 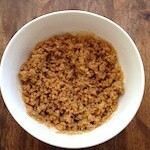 Mix the cookie crumbs and melted butter until moist crumbs form. 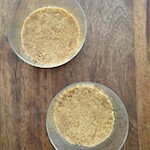 Spoon some crumbs into each glass and press firmly with the back of a spoon or fingertips. Make sure it is spread out evenly. Put the glasses in the refrigerator while the rest of the cheesecake is prepared. 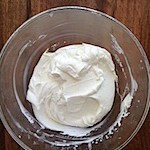 Mix the yogurt, cream cheese, powdered sugar and add it to the whipped cream, folding it in carefully. 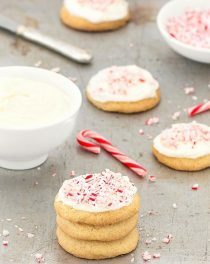 Pour this mixture on the cookie crust, level it and put the glasses in the fridge to set for at least 1 hour. Top with berries before serving. Enjoy! These are absolutely gorgeous and I love that they are no bake for the summer!! 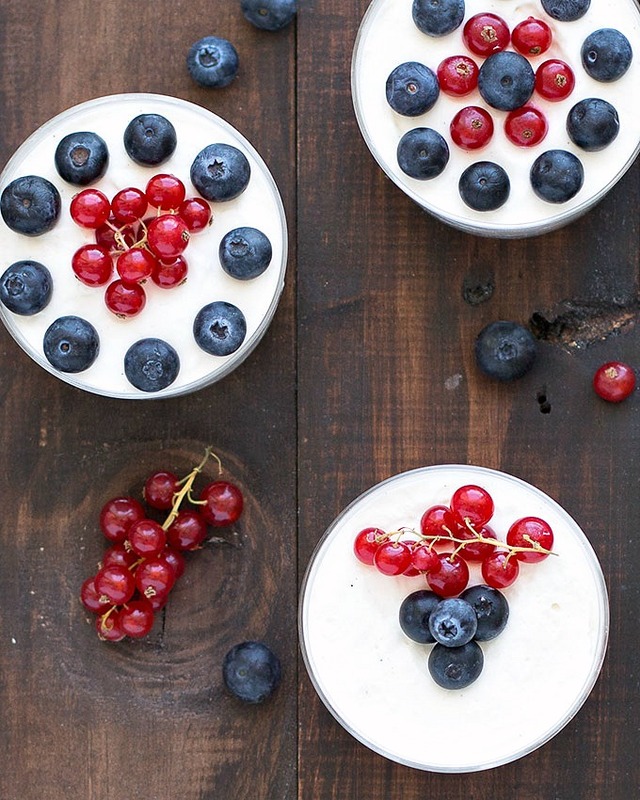 A perfect dessert for 4th of July and so pretty. Elena, these look simple, tasty and I love how you served them. Wow, I’ve been trying to get a good version of this going for months but the proportions I’ve been using haven’t been getting the best results. I’m going to have to try this. Thanks. I may have to indulge a little bit and use an Oreo crust. Oreo cheesecake may not be healthy or in any way good for you but it’s pretty damn good. By the way Elena, I would love you forever if you put up a pizza dough recipe. The ones I’ve gotten from friends all taste so American if that makes sense to you. I’d love a legit Italian recipe if you’ve got one. And even if not I trust you so if you were to post a pizza dough recipe I would be forever grateful. Oh, and I just thought you should know I sent your site to some friends of mine and they’re digging it a lot. They don’t comment much but it’s appreciated. Joe, I love reading your comments 🙂 Regarding the pizza dough recipe, do you prefer a thin-crust round pizza or a pizza baked in a tray similar to a focaccia? With sourdough starter or with dry yeast? Thank you! I love that you do! I prefer thin crust pizza. I’ve always been a fan of NY-style. Just my preference. I would say dry yeast would probably be my preference but I’m also not experienced with making dough so I’ll leave that to the expert here. Thank you! So yeah, the Oreo cheesecake turned out pretty well. It was a bit rich but hey, it was Oreo cheesecake so what do you expect, you know? It was good. So I have to say I do like this and I’ll try it again. Thanks for considering my request. I’ll be sure to check back periodically. I usually try to visit the site once a week or so. Take care. 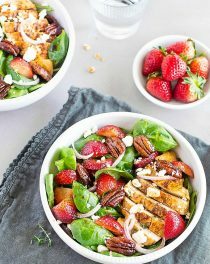 This looks marvelous! Can it be assembled, but for the fruit, a day in advance? Also, I will probably use cool-whip rather than fresh, to make it even easier. Will that work with this recipe? Thank you! Yes, you can assemble it in advance. I haven’t tried this recipe with Cool Whip but I am sure it will be fine.